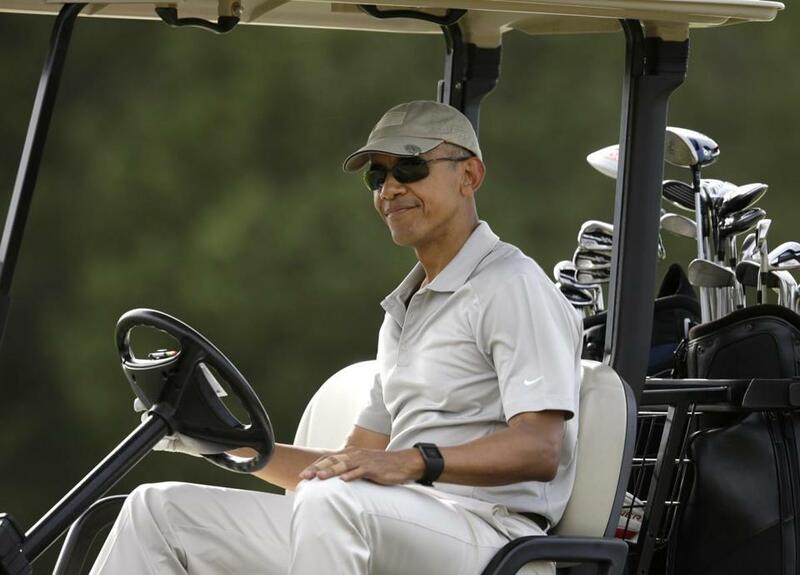 President Barack Obama drove a golf cart Saturday at Farm Neck Golf Club in Oak Bluffs. OAK BLUFFS — President Barack Obama is spending his first full day of vacation on the Massachusetts island of Martha’s Vineyard playing golf. 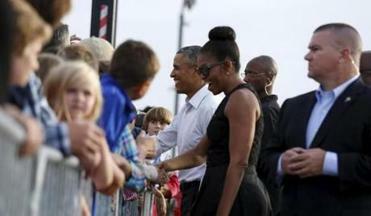 Obama arrived at Farm Neck Golf Club in Oak Bluffs on Saturday afternoon. The White House says he is playing with actor-comedian Larry David, businessman and Obama campaign fund-raiser Robert Wolf and Cyrus Walker, a cousin of top Obama adviser Valerie Jarrett. Reporters traveling with Obama were given a rare glimpse of the president as he leaned back on one leg as his ball approached the first hole. It did not go in. Obama left Washington on Friday with the first lady and daughter Sasha for a 17-day island retreat. The Obamas arrived later Friday at their vacation home in Chilmark, the same seven-bedroom, nine-bathroom property they rented last year, after a 20-minute drive over the picturesque island’s gently rolling hills and verdant green spaces. The president tries to lay low during vacation, and aides said he was not expected to make any news during his stay. President Obama and his family arrived in Mass. on Friday, a day earlier than originally scheduled, for a 17-day break. With no official appearances scheduled, Obama is expected to fill his days with leisurely rounds of golf, beach outings, bike rides, and hikes with his wife and daughters, and dinner with their friends at some of the island’s top restaurants. He traveled with a small group of aides, including National Security Adviser Susan Rice, and senior adviser Valerie Jarrett, who will update him as developments warrant. There is a chance that Obama and former Hillary Rodham Clinton, who is seeking the Democratic presidential nomination to succeed him, will see each other on the island. They are both expected to attend a birthday party for Ann Jordan, the wife of Democratic adviser Vernon Jordan. He is scheduled to return to the White House on Aug. 23. 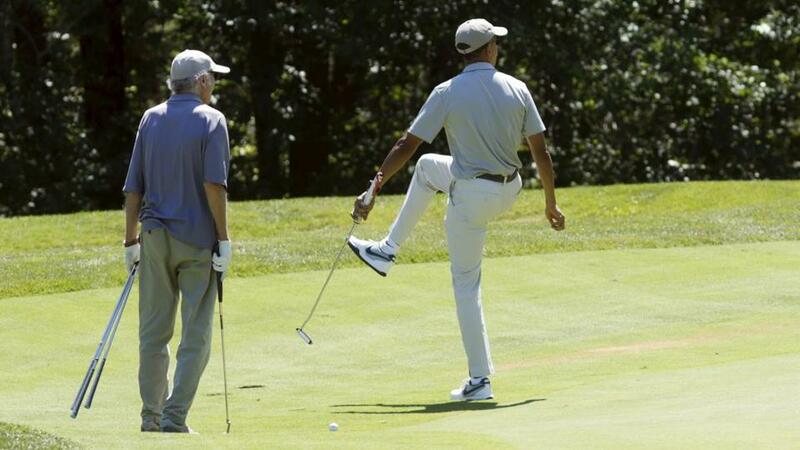 President Obama reacted to a missed putt. Actor-comedian Larry David (left) played golf with the president.